Throughout my PhD, I developed and characterised solvent-free liquid proteins. These novel hybrid materials are synthesized through the engineering of protein surfaces with a polymer surfactant corona, which allows for the realization of the liquid phase of dry proteins that is otherwise unattainable. 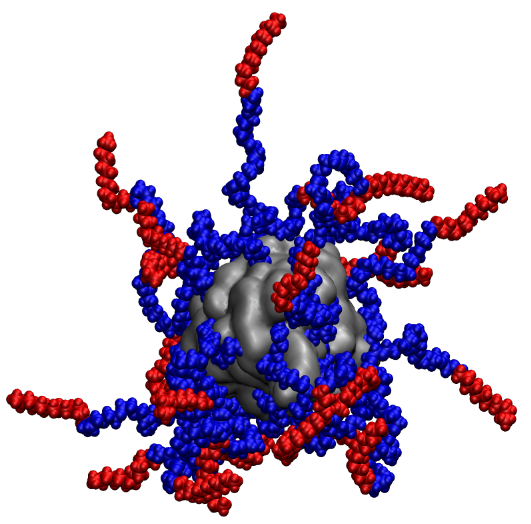 Nanoconjugates of a number of surfactant and proteins, including some virus capsids have successfully been shown to form liquids. My work in this area has been concentrated on understanding the properties and biophysics of solvent-free liquids of a handful of globular proteins and enzymes. Using myoglobin as an archetypal system, through my work we have shown that in the solvent-free liquid state, myoglobin retains both a significant amount of secondary structure, and the prosthetic heme group. Using synchrotron radiation circular dichroism (Figure 1A) to monitor secondary structure up to temperatures of 250 °C, we have been able to show that myoglobin displays extreme thermophilic behaviour in the solvent-free liquid state. In addition, using diffuse reflectance UV/Vis spectroscopy (Figure 1B), we were able to determine that myoglobin had retained reversible oxygen binding capability in the absence of any solvent. Furthermore, with elastic incoherent neutron scattering experiments, we were able to demonstrate that the surfactant corona was able to provide the necessary dynamics to act as a surrogate solvent. My work has developed to show that the solvent-free liquid state can be utilised to study proteins in an unnatural environment, unlimited by potential restrictions of solvent. Solvent-free liquid lysozyme has been used to demonstrate that within the surfactant corona, it is possible to isolate an otherwise reactive intermediate on the aggregation pathway. This novel intermediate was shown to be β-sheet rich as evidenced by SRCD (Figure 2A) and FTIR (Figure 2B). Therefore, solvent-free liquid proteins have the potential to help further our understanding of the structure of the intermediates that have a role in degenerative diseases such as CJD and Alzheimer’s. My work in this field then demonstrated that substrate recognition, and therefore enzymatic activity, in the absence of any solvent, was achievable. Remarkably, enhanced enzyme activity was observed at temperatures as high as 150 °C. In addition, as part of a collaboration with Dr. Richard Sessions in the School of Biochemistry, University of Bristol, I used molecular dynamics simulations to build a model of the solvent-free liquid proteins, and to gain atomistic insights into the potential structure of the material as complementary information to scattering profiles obtains by SANS and SAXS. This demonstrated that the organic corona was dynamic, as suggested by neutron scattering, and could respond to changes in the local dielectric constant.